Graptopetalum paraguayense is a plant that I use when I want something dependable and low care. The Ghost Plant grows in sun or shade and requires only a little occasional water. The plants are more blue in the shade and more pink in the sun. 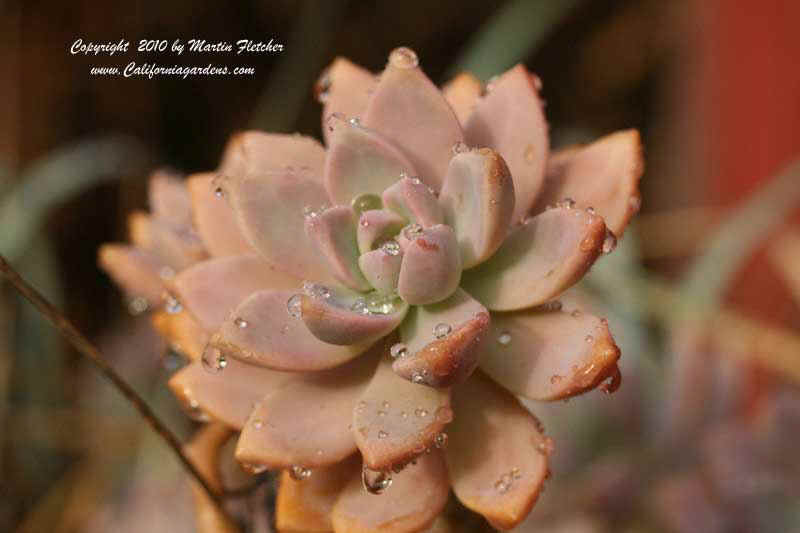 This succulent looks great trailing out of a pot or spilling out of a dry laid rock wall. The stems of Graptopetalum paraguayense will root even when they lay on concrete and soak up whatever spills from the neighboring pots. The Ghost plant grows to 12" and spreads a couple of feet or more. Graptopetalum paraguayense is Winter hardy into the low teens or even upper single digits. In full sun the leaves redden a bit Graptopetalum paraguayense - Ghost Plant. High resolution photos are part of our garden image collection.